Nektar Impact LX25 - Based on their award-winning Panorama, Nektar's Impact LX25 uses intelligent mapping to give you hands-on control over your session immediately. Switch between Mixer, Instrument, and Preset modes for a fast workflow. The Impact LX25's 25 synth-action keys give you a smooth, velvety feel, as do its pitch and mod wheels. In fact, all the controls - including the knobs, fader, and performance pads - feel amazing. 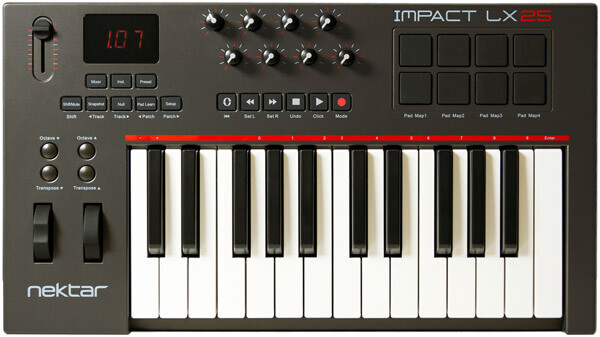 The Impact LX25's 25-note velocity-sensitive keyboard sports a silky synth action with medium tension. This makes it perfect for playing just about any type of part. To suit your playing style, you get four velocity curves that gradually increase in dynamics. For certain types of synth parts requiring consistent output, there are three fixed velocities. Pitch bend and modulation wheels are properly placed to your left, with the octave and transpose buttons above them. This is one nice controller! Nektar hit big with their Panorama range. Now they've done it again - at a more affordable price. The streamlined Impact series of controllers offers intelligent mapping and tight integration with most popular DAWs, preset mixer and plug-in modes, transport and navigation controls, midi programming capabilities, and five user presets. That's a lot of control. All for a song. Go for it! PreSonus Studio One Artist 2.6 continues in the tradition of its highly-recommended forerunner by vastly expanding capability without making it more complicated to use. Whether you are trying to record killer tracks, timestretch, or quantize drum parts, Studio One Artist 2.6 lets you do it with ease. With the addition of over 100 new features such as transient detection and editing, and easy interface configuration makes PreSonus Studio One Artist 2.6 a powerful DAW that is ready to make your biggest recording projects easier than ever. And if you use a PreSonus StudioLive AI console, Active Integration gives you powerful control over your mixer, seamless integration with Capture, a new Fat Channel plug-in, and more! Call your Sweetwater Sales Engineer today and find out more about the incredible Studio One Artist 2.6!